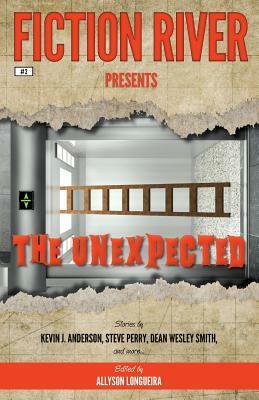 A multiple author short story collection. All of the main characters in this collection are young, high school age or younger. They all feel like they’re the underdog: powerless in their lives and often also unattractive. Almost all of the stories are written from first person POV. “Villainous Aspirations” by Stefon Mears is a story about young man who is waiting to get his superpowers. You see, he’s the son of two famous superheroes. He’s writing essays at school so this is all in first person. However, he thinks that his parents are stupid for helping other people for free, so he’s going to use his powers for personal gains. “A Kiss Too Sweet” by Eric Kent Edstrom: Monica is a high school girl who finds out that she has diabetes. Soon after, when she kisses a girl she doesn’t like on the cheek she finds out that she also has a superpower: anyone she kisses becomes devoted to her. However, that’s not just a good thing. “The Clunkety” by Brenda Carre: Gretti’s mother was a great hedge-witch so it was not surprise that Gretti is a witch, too. After a hard childhood, Gretti gets together with the young man she loves and even his kin grudgingly accepts her. But then her past comes back to haunt them both. “Power Trip” by Lee Allred: in this world, enough people get superpowers in high school that there are whole training programs for superpowered people. Sammy is a nerd but gets powers so powerful that he can’t show them, so he’s still bullied. The POV character is envious but still hopeful that he’ll get powers, too. However, he doesn’t want to use them for good, or evil for that matter. He would just want to continue with his life rather than going to the Supers Training Program and serving the government the rest of his life. “Pocket Full of Ashes” by Anthea Sharp: Kit is one of Victorian London’s street urchins. She steals for Old Nellie who keeps everyone in a tight leash. Kit was sick for three days but is now pickpocketing again. Only now, she finds out to her amazement that she can shoot fire from her fingertips. However, Kit is growing up and Old Nellie has noticed it – and Kit is in danger of become a scarlet woman of the streets. Kit must get away and her new power could help her. “The Ordinary” by Valerie Brook: The black monk has kidnapped boys from nearby villages. He forces them to learn how to manifest their inner spiritman and telekinetic powers. Tomas is the only one who can’t do that. If he can’t do it tomorrow, the monk will kill him and his parents. “Dawn” by Jody Lynn Nye & Rebecca Moesta: Aurora, the young goddess of dawn, is late to her duties for the fifth morning in row. That’s because she loves to stay up late to listen to the poets which is far more exciting than her dull duties. But inspiration is the arena of her friends, the muses, and her siblings Apollo and Artemis expect Aurora to do her job well. “Fatty Boombalatty” by Kerrie L. Hughes: Matilda Bloom is at a summer camp and it’s awful. Her former best friend Kiley has abandoned her for two rich, mean girls and even started the horrible nickname, Fatty Boombalatty. She doesn’t have any friends and must see the camp counselor. But then the counselor gives her a friendship bracelet and tells her that with it she can hear other people’s thoughts. “Passion for the Game” by Brigid Collins: Jimmy has superpowers and he’s using them to play baseball. However, he’s starting to think that he should be helping people instead of just playing a game. But for his older brother Jimmy’s games are a path to freedom for both of them, and their mother who’s in rehab. Then Jimmy’s powers disappear. “Just Stop It!” by David H. Hendrickson: Amy’s parents are arguing again. She tries to ignore it but finally they say so hurtful things that she yells at them to stop it. Incredibly, they do that. In fact, they’re quite civil after that. Amy decides to try this new power at her school. “Normal Boy” by Rebecca M. Senese: Ellis and Miguel are the only two normal people in Super High where everyone else has powers. But some of the most powerful supers are bullying them. So, Ellis decides to do something about it. “Sophie Rosenblatt, Hero At Large” by Annie Reed: Sophie in an unassuming, normal girl in a world were solar radiation has given some kids powers. For a while, Sophie was sure that her beautiful best friend would get powers but she didn’t. However, when Sophie has been home sick for three days, something unexpected happens. “Flowers in Winter” by Kelly Washington: In this world, everyone has powers, usually inherited from their parents. Mattie is a systemizer; she can organize small things very quickly. However, her mother and sister can control water. Her sister, Justine, has started to tease Mattie mercilessly about her lack of impressive powers and also about Mattie’s bum leg. “Hidden Talents” by Dayle A. Dermatis: Tilly has enough magical talents to be accepted to Miss Rosina Wakenshaw’s School for Talented Girls. Unfortunately, her own particular talent hasn’t surfaced and in two days time, the whole class will be represented to Queen Mary so that their magical talents can be put to proper use. Tilly is seriously considering leaving behind, especially because she’s become so clumsy lately. But her best friend Gwendolyn won’t let her. I’d love to read more of Tilly and Gwen’s adventures! “The Ballad of Osmosis McGuire” by Travis Heerman: Oswin McGuire is terribly bullied at school by the stars of the wrestling team so he can’t do anything about it. But one day, he feels an electric snap go through him and everything changes. These are all uplifting stories about teens overcoming bullies, their own low self-esteem or finding their inborn talents. None of the powers are overwhelming; they all are limited or have down sides. However, they also highlight the bad sides of Western school system, namely that it seems that people don’t want to put an end to bullying. It’s more YA focused than I expected. Otherwise this is a fine collection with superpowers and some magic thrown in, as well. The third Fiction River subscription drive at Kickstarter is alive. It contains very nice stretch goals which means that the more people subscribe, the more books we subscribers get. 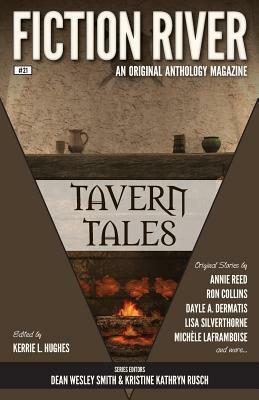 Fiction River is an original short story series with six issues a year. The theme varies every time and so does the genre. I’ve enjoyed every issue even though I’m woefully behind on reading the newest issues. 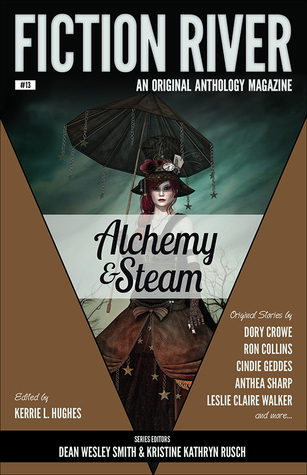 A short story collection focusing on steampunk with magic through alchemy. “The Rites of Zosimos” by Angela Penrose: the collection starts with a story set in a magic/alchemy school. The story has two such schools. A body is found, naked and boiled. Sir Peter Estridge, assistant to one of the deans, is pressured to investigate the murder together with Lady Catherine Morwood, the Grand Dame of the other school. “Heart” by Leslie Claire Walker: Sebastian is a powerful necromancer who has an unhealthy obsession with Erynn. Sebastian has also murdered Erynn’s love. Erynn can think of only one way to escape. “Pennies for Portents” by Diana Benedict: Francie’s brother can build really good mechanical machines. One of them is Madam LeGrue, the mechanical fortuneteller which is the only reason they’re allowed to travel with a carnival. Unfortunately, the fortuneteller has started to behave strangely. “The Order of the Golden Grapefruit” by Sharon Joss: animated chocolate! Fritz’s father was an animator for the army. Unfortunately, the horrors of war have affected his mind and so he and Fritz are seeking employment from one of the best confectionary shops in Belgium. The shop needs are spectacular display of animated chocolates. “The Perfect Perfume” by Anthea Sharp: Charlotte’s parents were the best perfumers in London. But when they died, Charlotte wanted to continue their legacy. She just needs something extraordinary as an ingredient to create a truly wonderful perfume for Queen Victoria II’s jubilee. “The Grand Dangoolie” by Ron Collins: Set in WW2, the Grand Dangoolie is the stage name for August McDormand who claims that he knows real magic. The main character’s boss, Houdini, wants to prove that McDormand is a fraud. “The Whirring Dreams of Aberrant Blood” by Cindie Geddes: In this world, girls with the correct type of blood, called aberrants, can bring mechanical wonders to life. “St. Jean & The Dragon” by Brenda Carre: St. Jean is a jinni and his master is Jane Watson, who investigates paranormal happenings. Something is stealing people, and everything seems to be connected to the house of an old woman who herself hasn’t been seen in months. “Weight in Gold” by Dory Crowe: McKenzie Ross is traveling on a steam ship to the US to study there. Her father is also onboard but in disguise because he’s smuggling gold and knowledge from out of Napoleon’s Empire. “Heaven’s Flight” by Leigh Saunders: Paige wants nothing more than tinker with all things mechanical. This makes her parents cross because they want to see her married well. However, when one of Paige’s mechanical wonders records a mysterious and threatening conversation, she and her maid must do their best to avert disaster. “Blood Moon Carnival” by Kim May: Fia is a phoenix, trapped in a half bird, half human form by the Ringmaster who uses alchemy to trap various mythological beings into his circus and display them. “Makes the World Go ’Round” by Kelly Cairo: 10,000 years ago, two technicians were assigned to work on the pyramid at the same time. The pyramid is responsible for keeping the world turning. The technicians fell in love but now one of them has died and the other must find love again, or the world will stop turning. “Myrtle’s Boxes” by Louisa Swann: The Philosopher’s Stone is in Myrtle Creek’s left eye socket. Unfortunately, the souls trapped in the stone are driving him crazy and he has to find a way to free them. These were all delightful tales with various steampunk gadgets and alchemy. I highly recommend this collection if you like steampunk at all. Only two of the stories were really dark, “Heart” and “The Whirring Dreams of Aberrant Blood” the others are mostly fun. As a chocolate lover, I especially liked “The Order of the Golden Grapefruit”. The second Fiction River short story collection. Like the name implies, these stories focus on solving problems that humans are facing today. They each focus on a different problem, though, which shows just how many problems we have. All of the stories overcome problems that humans themselves have created, not outside threats like an asteroid hitting the Earth. I liked most of the stories and my favorites are “Flight of the Little Bird”, “Neighborhoods” and “The Legend of Parker Clark and Lois Jane”. 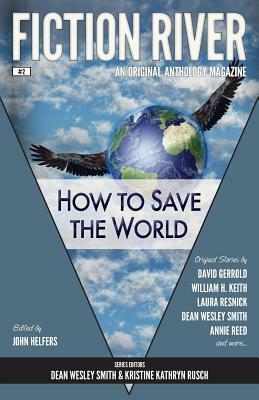 “The Gathering” by David Gerrold: In this story, a group of people who want to save the world have gathered together and discuss their past successes and failure. And why they always fail. “Positive Message” by William H. Keith: Sunrise Earth is a company which specializes in solar power. But when the company starts to get real successes, the old oil companies fight back. “The Legend of Parker Clark and Lois Jane” by Ron Collins: Clark is working on reducing carbon emissions when suddenly his boss tells him to stop work. However, he was very close to a breakthrough, so that decision makes no sense. Until Clark realizes something. “Your Name Here” by Laura Resnick: the main character works in the population control office. Some people desperately want to procreate despite not passing the tests. “Flight of Little Bird” by Stephanie Writt: Tara hates her job and feels that she’s very small and worthless. She wants to be so much more, but doesn’t know how. But then she has an idea and everything changes. “Staying Afloat” by Angela Penrose: many fields are suffering from too much rain. Paola is trying to find some good and cheap solution that small and poor farmers could use. “The Shape of a Name” by Annie Reed: Anisha is a war orphan who has lost her arm. One day, one white woman comes to the refugee camp and takes her away, to a girl school. “Neighborhoods” by Dean Wesley Smith: an eccentric millionaire is disgusted with the news of continuing violence in his home city of Chicago and he decides to do something about it. “Heaven Backwards” by Lisa Silverthorne: In the future, the Earth is a desert because of the sins of people who didn’t follow the Word. But one small settlement still survives. However, some of their children have been disappearing. Then, three outsiders are at the gates. “Earth Day” by Kristine Kathryn Rusch: the mother of the main character was obsessed with saving the Earth and her son continues that trend, although probably not in the way that the mother intended. “Deus Ex Machina” by Travis Heermann: the world’s first functional artificial intelligence awakens. 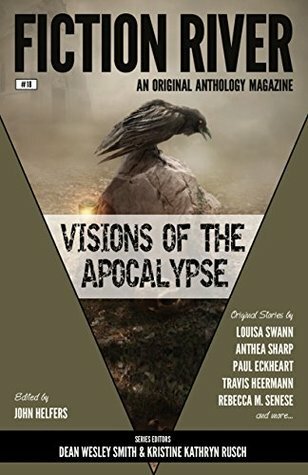 A short story collection about… the end of the world. As you might expect, these are pretty intense stories. All of them are emotional, one way or another. I’m actually not a huge fan of apocalypse stories, except for Terminator movies (and in them, it’s about avoiding the end of the world) but most of these I liked. Most of them are chilling stories, one way or another. When society’s rules break down, some people will only think of themselves but fortunately not all. Otherwise, humanity wouldn’t have evolved to have a society at all. This seems to be something that people are forgetting these days. I think every story ends the world in a different way. I’m not entirely sure if I should enjoy the creativity or find it chilling. The stories have been divided into several parts: just before the Apocalypse, the beginning of it, during it, surviving after it, and three stories which describe the whole thing. “String of Pearls” by Eric Kent Edstrom: The world has just heard that comets will strike the Earth and end human life. Lucas Piper and his girlfriend Vicki are among them. Lucas regrets not doing anything meaningful with his life. When they go to get more beer from the local small shop, they find out that the elderly shopkeeper has been murdered. Lucas decides to do something. “The Shoes I Wore This Morning” by J. Daniel Sawyer: Lord Phineas Roxton Summerlee has just returned from an expedition where he and his small party were looking for a city of gold from the Amazons. The locals warned him away from it, but he didn’t listen. “The Dust Devil, the Riffraff, and the Big Orange Sunset” by Valerie Brook: Charlene Lynn Weaver is a patient on a psych ward. She and all the others have been locked up and nobody has come in the morning to care for them. Dust storms rage outside and the fine dust has filtrated inside so it’s not possible to leave the building. Charlene is one of the few people who know what’s really going on. “Goin’ to the Chapel” by Rebecca M. Senese: In just three days, Marlee is going to get the perfect wedding she’s dreamed about since she was a little girl. Unfortunately, that’s the day when aliens invade Earth. “With Wings the End” by Rob Vagle: The world is dying because people’s hearts are turning into blackbirds and flying away. The birds have mirrored bellies and fly in tight formation. Jeffrey wants to stay in his house, away from danger but his wife Laura wants to meet her friend whose heart is changing soon. On the way to the hospital, Laura also contracts the disease (or whatever it is) and Jeffrey brings her home to die. “Cogs in the Machine” by Paul Eckheart: The Tickers have wiped out much of humanity but the survivors defend the remaining settlements. Tania wants to be part of Major Townsend’s village but she has a secret which might destroy her or save humanity. “The Faerie Invasion” by Anthea Sharp: Ric Garcia is trying to protect his little sister from murderous fey folk who have invaded all of USA. But Angelina is sick and Ric doesn’t know what to do. Then the Wild Hunt come to their hiding place. “Demon-touched” by Travis Heermann: Something infests or possesses humans. When they’re “ridden” (as it’s called) they do terrible things but don’t remember any of it afterwards. The narrator is a neuroscientist and one of the few who is still looking for a cause and a cure. But this time he awakes from “being ridden” in a cage with a shotgun in front of his face. Survivors: Apocalypse came years ago but some survived it and have to continue living in a drastically changed world. This is perhaps my favorite setting for an Apocalypse story. “Same Time Next Year” by M. E. Owen: 15 years ago something changed many people into Beasts. Still, Arlene’s family has a tradition to gather and celebrate their continued existence. But now they’re late and Arlene is worried for them. “The Story That Has to Be Written” by Louisa Swann: A giant solar flare has wiped out a lot of humanity and made the whole planet much drier. The narrator, who is seven years old, her little brother, and father are still struggling to survive in a world where food is hard to come by because most of plant life can’t grow and most of the animals are gone. “Tyrph Rights” by David Stier: USA is a wasteland thanks to genetic engineering gone wrong. Today, Devin and his new partner Rahel are going to try to get inside the Loop – the dangerous remains of the Sears Tower. “Paradox. Lost.” by Stefon Mears: The narrator has invented a time machine and it turns out to be a big mistake. Time travel doesn’t work like any of the theories. “The Night of Brahma” by Leigh Saunders: Reina Varela Harrak can see the future but it hasn’t brought her happiness because only rarely have people believed what she has told them. Including her own family. Partly because they’re struggling to survive in the horrors of the Endless War. “Three Degrees Above Zero” by Doug Dandridge: Scott Stafford was an astronomy teacher in Florida. Now, he might be the last man left alive on Earth because of a neutron star. The most science oriented story in this selection. Reprints some of the funniest stories from Fiction River. “Generations” by Steve Perry: from “Fantasy Adrift”: Ziggy and his brothers live in a frontier planet where police aren’t around. When their enemy has a new toy, Ziggy has to get creative. “Case Cracked” by Joe Cron: from “Fantastic Detectives”: Frank Dumpty is a hard-boiled detective in Magic City Police Department. A troll has been killed and Frank has a strong hunch who is behind it. But getting justice in a corrupt city isn’t a laughing matter. “Role Model” by Kevin J. Anderson: another funny story from “Fantastic Detectives”: Dan Shamble is a zombie P.I. While working in a Cosplay Convention, he gets a sidekick: someone cosplaying him. “Finally Family” by Ray Vukcevich: from “Unnatural Worlds”: Bugboy is an alien but he can’t tell people that. He lives in Japan but doesn’t even know the language. Then he meets Kimiko who teaches English to the Japanese. “Time, Expressed as an Entrée” by Robert T. Jeschonek: from “Time Streams”: time devouring Rainbow Leviathan eats up everything until just one day is left. Then he encounters an anomaly. “One-Night Stands for Love and Glory” by David H. Hendrickson: from “Universe Between”: the main character is a stand-up comedian. He used to be great but now unfortunately his Artificial Intelligence, which translates the jokes to the local language and culture, has begun to deteriorate. “Earth Day” by Kristine Kathryn Rusch: from “How to save the world”: One man thinks that he can save the world. His mother was an ardent environmentalist and so is the son… in his own way. “Jelly’s Heroes” by Louisa Swann: from “Valor”: Staff Sergeant Jillian K. Wilson was given the task of training a small group of locals at Centauri VI. However, the locals are small and have no arms or legs. But that doesn’t mean they lack the spirit. “Nice Timestream Youse Got Here” by Lee Allred: another story from “Time Streams”: the narrator and his good-looking but dumb partner Maizie work for the Temporal Protection Agency. This time they’re in New York City in 1940, looking for their next target. But they aren’t in it to protect any timeline. “In the Play of Frigid Women” by Dean Wesley Smith: from “Fantasy Adrift”: Poker Boy and his love the Front Desk Girl are superheroes. However, this time they’ve decided to relax on a cruise. Everything goes smoothly at first but then a terrible storm hits. This time, Poker Boy and his gang have to really stretch their creativity to save the day. These are all fun. I especially liked “Jelly’s heroes”, “Generations”, and “One-Night Stands for Love and Glory”. I’ve read previously about half of these stories but enjoyed them again.